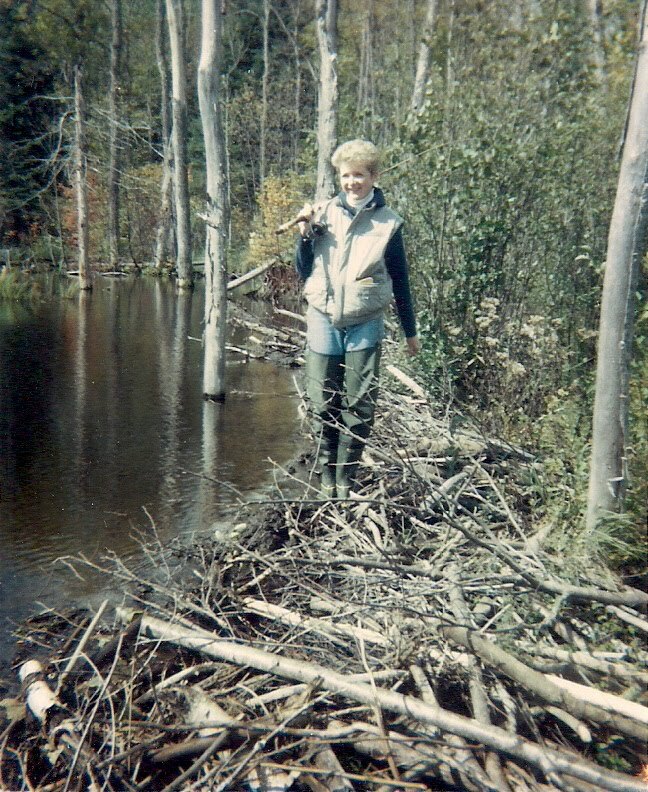 High Heels in the Wilderness: Between the Lines: Celebrating Bloggers Over 50. My birthday is in a couple of weeks. I turn the big 6-0. Akkk. Can't quite believe that. Maybe that's why I've been thinking and writing a lot lately about the changes that come with age. Both physical and emotional. If you read my blog regularly you'll know what I'm talking about. If not...well... it appears that I've been obsessing about grey hair and wrinkles. And what to do about them. Or not do about them. And I've been thinking about identity, and how the major life changes that go along with age, like retirement, make us rethink who we are. And maybe even give us the luxury of crafting a whole new identity. But change, even welcome anticipated change, ain't easy, people. It can be a bit of a bumpy ride. Better have your seatbelt fastened. I love Bette Davis. And her off the shoulder dress in this scene in All About Eve. Davis' character Margo realizes in the film that getting older has its compensations. It seems funny now to think that Davis was only forty-two when she played the role of "aging star" Margo Channing. But aging does have its compensations. And retirement is one of them. And the new paths that we forge when we retire. Which for me included starting this blog, and then "meeting" all kinds of new virtual friends, readers who comment on my blog, and other bloggers. Like Katie who writes the blog Katherine's Corner. For the last few weeks Katie has been running a series called Between the Lines which celebrates bloggers who are over fifty. Like moi. I knew when I retired that I wanted to write a blog. And so I researched blogs, and made lists of possible post ideas, and hemmed and hawed about what to name my blog... ad nauseam. And finally I just jumped in. Pressed "publish"... and gritted my teeth. And sweated with fear. And embarrassment. What was I thinking? Okay, I was pretty confident about writing my book posts, since I had spent almost thirty years teaching English, and had been an avid reader for a lot longer than that. But, why would anybody care what I had to say about anything else... let alone fashion, or travel? Or life growing up in New Brunswick? But these were the things I wanted to write about. And since I had been teaching kids for years that they should write about what interests them, what makes them mad or glad, I seriously wanted to take my own advice. And if I wasn't going to write about my passions, why bother writing at all? So, as you can see, there was a lot of hand wringing those first weeks. And then I just settled into the blog groove. And it's become one of the most satisfying things I've ever done. Right up there with that first grade nine Shakespearean Drama Festival: "The Faces of Love" that my friend Susan and I ran back in 1995. And which was perhaps the most satisfying moment for me in my professional life. When a reader comments on my blog that they enjoyed a post, or laughs at a silly story I've told. Or says that a fashion post has given them ideas for their own wardrobe. Or when someone says they really, really get the essence of a person I'm trying to describe, like my stepfather, who I've written about often. When readers come back to check replies I've made, and to read other comments by other readers, and then even begin a conversation among themselves, like with some book posts. That feels amazing. And really, really gratifying. 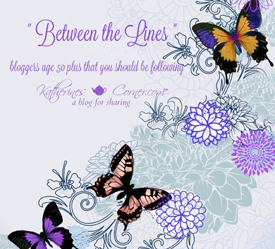 So a few weeks ago when Katherine asked for bloggers who are over fifty to be part of her series "Between the Lines," I thought, "What a great idea." The point of the series is to introduce "over 50" bloggers to each other and to the readers of their respective blogs. Hence the discussion of why I blog. Which I know is probably old news for those who visit here regularly. Sorry about that folks. But if you click on any of the links below, they will take you to the posts of other "over 50" bloggers, who might be new to you. Or if you click on the title of the series Between the Lines, you can peruse all of the blogs featured in the series. And for those who are new to High Heels in the Wilderness, I popped a bunch of links into this post that will take you to other posts on my blog, about fashion, or books, or just about life. Hope you find something interesting to read. I must say... turning sixty... does have its compensations. My friend Elizabeth and I are planning a girl's trip for the fall to celebrate my entrance into a new decade. We did this back when I turned forty... ah... twenty years ago...gad! ... hard to believe. We plan to eat, drink, soak up some culture... there may be shopping. Ha. "May" is perhaps the wrong word to use here. Okay, I confess, "may" is definitely the wrong word. Let's just call it "aging compensatory shopping" shall we? How about you, folks? Any significant birthdays coming up? What are the compensations of age as far as you're concerned? Thank you. I'll possibly be brave enough to link mine to the over 50s but I'm not yet where you are. My blog is pretty amateur but I quite like it that way. I'm chaotic and it represents me. I have started a new blog on style but that also is amateur compared to others around. Thanks for the inspiration and encouragement for we over 50s. Thanks for dropping by, Anna. I agree; I think it's important for a blog to represent who we are. Otherwise, why bother? We are amazing! Here's to sixty more! Thanks for telling me that, Nikki. Hope you find some other blogs that you like to read as well. 60 was the first birthday that I stressed over. 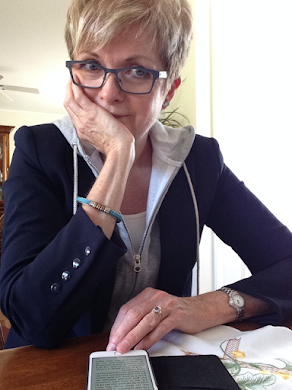 In fact, I kind of wasted 59 worrying about turning 60, only to discover that I'm quite enjoying my 60s in spite of some unexpected challenges! Here's what I wrote about a month before my 60th birthday https://edebock.wordpress.com/2012/08/29/coming-to-terms-with-60/ and this is what I wrote the day after https://edebock.wordpress.com/2012/10/06/blessed-to-be-60/. I will definitely read that, Elaine. As I said to friends last night over dinner... 40 didn't worry me at all, nor 50... but 60 does. Not sure why. Thanks, Carla. And thanks for stopping by. I will turn 67, yikes, on the very last day of May. Hearing myself say that sounds so old. I don't feel that old. I do love your blog and take a lot of fashion tips away with me as I read. I have been retired for 7 years. I think one compensation I have noticed is that younger parents with children often ask me for advice regarding school and their children. I taught grade school for 25 years. It gives me a feeling of being respected and appreciated. When I retired I was able to pursue an online sewing and embroidery business. I am enjoying having the freedom to do that on a when-I-feel-like-it-way. I can put my shop on vacation if we need and/or want to leave town. I've been to your blog before and have left comments, but it's nice to see you on Between the Lines too. Following on Instagram. Hi Susan. I'm loving meeting new ladies like you through Between The Lines. 60 is young or at least it seems so when you are about to be 66. Eeeeek. Love your site. Thanks Deborah. And thanks for dropping by. One great part about midlife is just doing what you want to do and not worrying about what people think. I started by blog in December and write about what interests me. That's the only way it works. And so far, so good. A pleasure to meet you through Katherine's Corner! I agree, Cathy. Thanks for stopping by. I have said to younger friends that the only compensation to getting older is that while I don't like getting older, I don't want to go back. I am still working and hope to reach full retirement age. My husband has Parkinson's disease which has changed our lives and will continue to do so. Who will I be in retirement is a question I ponder and for which I have no answer. I find myself reading blogs by young women and chide myself for being foolish. Blogs like yours really do help me keep my perspective, so thank you for the links to more. Glad you found something here, Mary. Thanks for saying so. Hi Sue! I try to think along the lines of ...age is only a number and it's how you actually feel that counts! I have friends who are younger than me, who seem older and vice versa! My mum was an "older mum" in that she had me when she was 40 but she was always youthful in her attitude to life ...one of her traits I hope to have inherited as I certainly don't share her love of housework!! Thanks for sharing these new blog links and a BIG thank you for deciding to write a blog and such a great one at that! Me too, Rosie. Want to have my mum's verve when I get to be her age, 88. Funny that now she finally seems to have lost her taste for housework. She'd much rather be reading or tending her flowers. I retired from my job running a community non profit at age 60. I'm now looking at turning 65 this fall and I just can't believe it. I recently started a wine and cheese group for recent retirees. To a person,no one wants their old job back! I'm so grateful for this next chapter, as we call our group, with opportunities to pursue new passions, stay up late watching an old movie or reading a book, shopping during off hours or just doing nothing. While I loved my career, I'm finding this phase more rewarding for family time and me time. Always enjoy the sisterhood of your blog! Thanks, Chris. I'm like you...loved my job... glad I'm not doing it anymore. I'm late commenting - been wracking my brains trying to think of something good about being in my dotage ! Well there's all those great books , films & TV I can enjoy again as I can't remember them from first time round . I can get dressed in the dark , be a fashionista & get snapped by Ari Seth Cohen . There are the party invitations I can turn down as I've learnt I really don't like rooms full of strangers , because I'm not an extrovert . I now know which people I want to spend time with & which to avoid . I've learnt I don't need to frantically tick off a 'bucket list ' & would rather walk the dogs than go bungee jumping or hang gliding - enough of the grumpy old woman - I actually love this part of my life with all it's freedom . I still do a lot of hand wringing and get that cold sweat 'what have I done?' feeling once in a while. But, blogging has been very satisfying for me too. I've been kind of off the grid for a bit, so didn't know about katherine's Between the Lines series. Glad I read about it here. Happy Birthday and new decade! You are rocking being 60! Hello, Linda in Montreal! Thanks for the kind words. Thanks Iris. It is a nice position to be in...freedom, and the financial security to take advantage of it. I need to remind myself of that now and again! Hello..I'm a beginner blogger and looking for someone to help a 6o year old get started...lol.. If you know anyone that can find some time to help, please let me know. My email address: victorcourville@gmail.com...I just bought a domain name and a mojo theme, but I cannot figure how to get my theme I bought through mojo and start with my new domain name. I hope to hear from someone soon..Thanks! Right behind you at fifty-six, and getting ready to retire from teaching in a couple of years! We are indeed the most fabulous group out there!! I'm joining you in the 60 year celebration soon. I'm not near retirement and that is okay, although some spare time to do things like blogging will be appreciated when the time comes. I've been reading your blog for a while and really enjoy it. Thanks for sharing! I really want to start a blog and have been mulling it over for a while. I'm stuck on things like how to set up a blog, what to name the blog, how to organize it (that's all). It looks like I'm not alone. You're welcome, Dottie. That's what I did before I started my blog. I read lots of blogs for a year or so when I was still working. Then I read lots of articles about blogging before I did anything. You have to sort the wheat from the chaff, as they say. But there is a ton of good info out there. I just had to sift out all the hype about how to make money etc etc since that is not what I was aiming for. And then I started making lists about what I wanted to write about, what my blog "themes" would be etc before I even began. That whole process itself was fun, I thought. Hello Susan, I'm finally getting caught up on the Between The Lines series. Always good to meet up with other bloggers close in age (I turn the big 60 in two years), who are also Canadian, and blog on the Blogger platform like myself. I have to say you do not look like someone about to enter their 60's. I hope you have a fabulous girl's birthday weekend!